So, you’ve all seen me do some my hairdos on myself via my tutorials, but I’ve recently been let loose on others! I’ve been styling some pinup girls for my chum Tony Nylons, and I thought I’d share some of the results with you all, and pass on a bit of news relating to it all! First up is the first shoot I did for Tony. The model was Sinderella Rockerfella, and we shot at a Hot Rod garage in the depths of Bedfordshire. Then I styled my lovely friend Miss Mink, the Pinup Poet! These shots were taken for Nylon Flash Magazine, the periodical for those who appreciate a well-turned leg in a pair of fully-fashioned stockings. The current issue also happens to feature pictures of yours truly! Then we have the gorgeous Miss FanTeasy, burlesque star and owner of some seriously luxuriant tresses! Anyway, apart from me showing off a bit, the point of this post is to reveal to you that I will be helping Tony do pinup makeover photoshoots at Rhythm Riot this year! You’ll have your hair styled by me, your makeup done by the super talented Nicola, who manages the What Katie Did boutique and is a professional makeup artist; and photos of your experience to keep as a fantastic souvenir. Please note, that these are pinup *makeover* sessions – the hair and makeup is part of the experience. If you would rather do it yourself, and there are plenty of gorgeous girls out there who can, we’re not offended, but that’s not the idea of these particular sessions. But please do feel free to book a session with Tony at another time! Visit The Casting Couch if you’d like to book a session for while you’re there. all hairstyles are great, you're good! I absolutely love your posts! If I had half the talent you do when it comes to styling, I'd be showing off on a regular basis. Your blog is helping me shape my own personal style, bit by bit, so many thanks and keep the wonderful stories and photos coming! Enjoy your holiday! Wonderful, as ever… all the girls are so cute!!! I have a very long hair, it gets to my waist, actually, I,ve had it half of my life, but I,ve been thinking about cutting it. I,d love to do cute hairdos, but I,m not able, because it,s too long. I,m thinking about cutting at the level of the throat at the back, and pointed at the front, much longer, about 5 inches longer than the back. 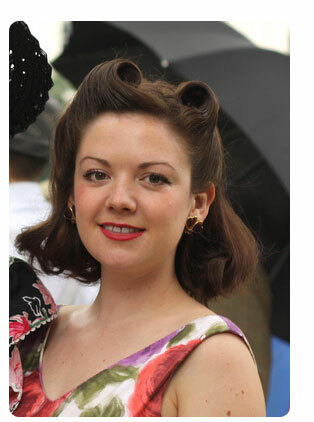 I,d be able to do the Victory rolls, and much more things. So.. I,d like to know your oppinions, girlies around here, and I,d specially appreciate yours, Fleur. Great work on the styling! And doing makeovers sounds like a lot of fun. I think I should start attacking my friends' hair and see if I can do any better than I used to on others. Hehe. PS Have a fab holiday!! You just might have a new job possibility there ! 😉 Have a great holiday ! Your work is beautiful! I've featured you and your work on my blog. Keep up the spectacular work!! Alraune – I can't picture the hairdo you mention – I have mine cut the exact opposite way – longer at the back than the sides and it's perfect for all vintage hairstyles!